Whilst London’s urban sprawl screams ever outwards there is green-tinged tranquillity at its heart. 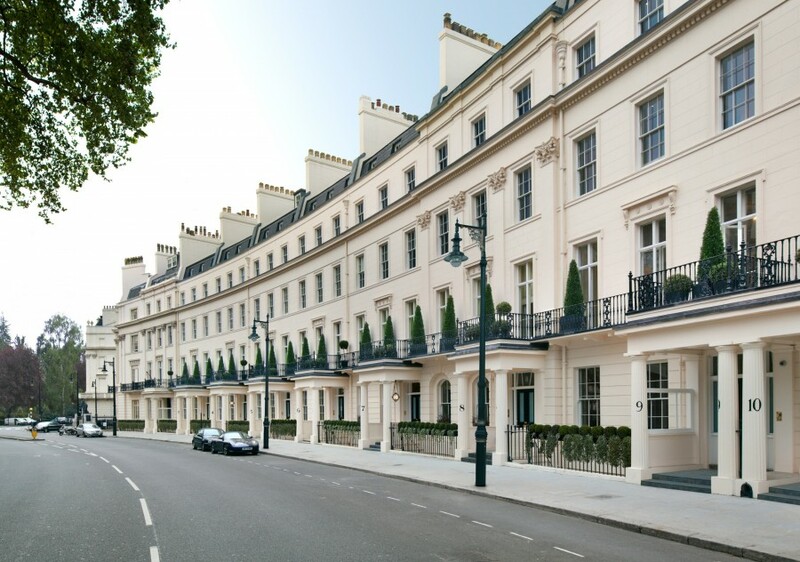 Everyday Belgravia looks more like a Victorian or Edwardian village, a nostalgic glimpse of the past but also an optimistic take on the future. There are signs, give or take the odd Bentley and Rolls Royce, that pedestrians are finding their feet again. In a throwback to bygone days, bicycles are serenely cycling across the cobbles of Belgravia’s streets. A wicker basket on your bike – filled with a sour-dough Poilâne country loaf, a hunk of a specialist cheddar from the Fine Cheese Company and a personally recommended bottle of Bordeaux from Jeroboam Wine Merchants – is Belgravia’s latest must-have accessory. First and foremost, Belgravia is home for a privileged elite living in white stuccoed mansions, green squares and quiet mews. Shrewdly, the Duke of Westminster knew that London’s folk would pay handsomely to rub shoulders with Buckingham Palace royalty. Thomas Cubitt, master-builder, of Belgravia’s elegant townhouses, is still honoured at the eponymous pub on Elizabeth Street. Guests staying at the rather luxurious Jumeirah Lowndes Hotel are able to saddle up, borrowing retro British bikes: Kingston Bicycles with a patriotic red, white and blue Belgravia livery. 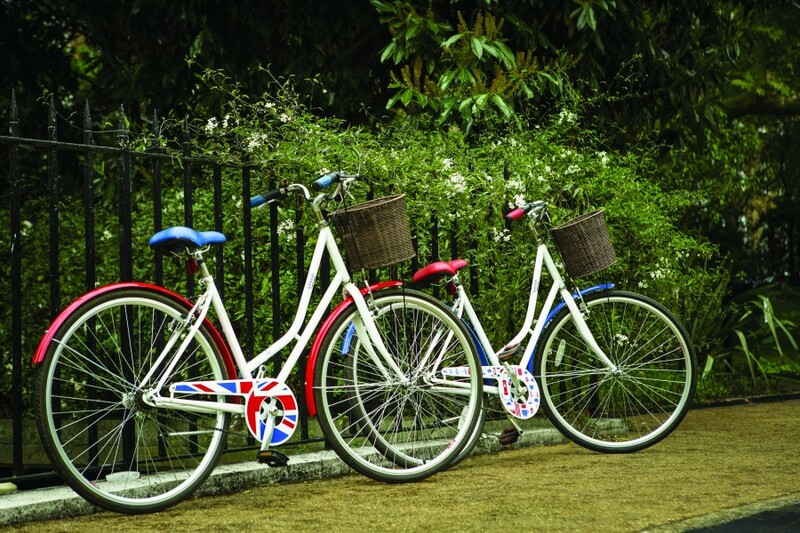 They can also sign-up for a Tally Ho cycle tour of Belgravia and Beyond with a knowledgeable guide using quiet roads to introduce visitors to Belgravia’s surprising charms. Cobbled Motcomb Street, largely pedestrianised, is an ideal place to begin your explorations. For those with Imelda Marcos extravagant shoe-collecting tendencies – the Philippines’ dictator’s wife had 2,700 pairs – there is a Christian Louboutin shop on the corner. Whilst ladies shop for shoes, gentlemen can refresh their wardrobe, with Milanese flair, at Italian tailor Gio Genco. 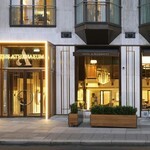 Belgravia is renowned as a shopping destination for brides-to-be too. Stewart Parvin, couturier by Royal Appointment to the Queen, creates made-to-measure tailoring for ladies as well as bridal gowns from Motcomb Street. Yet the majority of the stylish shoppers are in search of life’s everyday little luxuries. Making up a lunch box of amba, endame purée, zhoug, octopus in chraimeh sauce and yuzu kosho mayonnaise. Or sourcing some freshly hand-crafted chocolate truffles. Although bakers and delis often open at 8am many of Belgravia’s artisans are rather slow to open their doors. 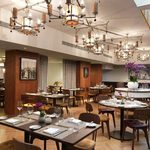 If you are staying just around the corner from Motcomb Street at the Jumeirah Lowndes Hotel – it is a serenely peaceful 88 room boutique hotel with 12 of those rooms designated as one room suites – you can linger over you breakfast in the Lowndes Kitchen. Guests at the Jumeirah Lowndes have time for a stroll across to the Peak Health Club and Spa – either for exercising or pampering – at sister hotel, the Jumeirah Carlton Tower. Many shops do not open until 10, 10.30 or even later – and you would struggle to get an authentic Parisian Macaroon before noon. Heading south, you pass Eaton Square, fictional home to the Bellamy Family in the television drama Upstairs, Downstairs. Julian Fellowes, sensing a follow up to Downton Abbey, wrote Belgravia a rattling nineteenth-century tale of intrigue and scandal. The Jumeirah Lowndes celebrates Belgravia’s literary links with a “Book and Brunch” event on Sunday mornings. Belgravia’s writing residents have included Mary Shelley, Virginia Woolf and Ian Fleming. Staying on the Bond Theme, Sean Connery and Roger Moore lived in Belgravia. Whilst Belgravia’s most notorious inhabitant – Lord Lucan had a screen test for the 007 role. “Not a lot of people know that,” Michael Caine may have added as he headed for his own Belgravia Mansion. Elizabeth Street, with yet more precisely clipped topiary, is Belgravia’s southern enclave. 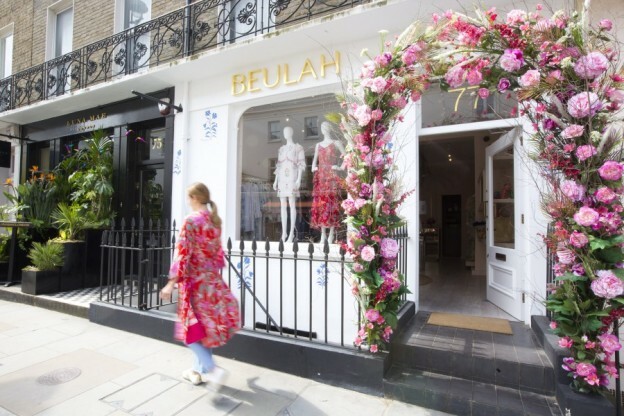 As you’ll see from the extravagant floral arch to the Beulah boutique, they take Belgravia in Bloom rather seriously. 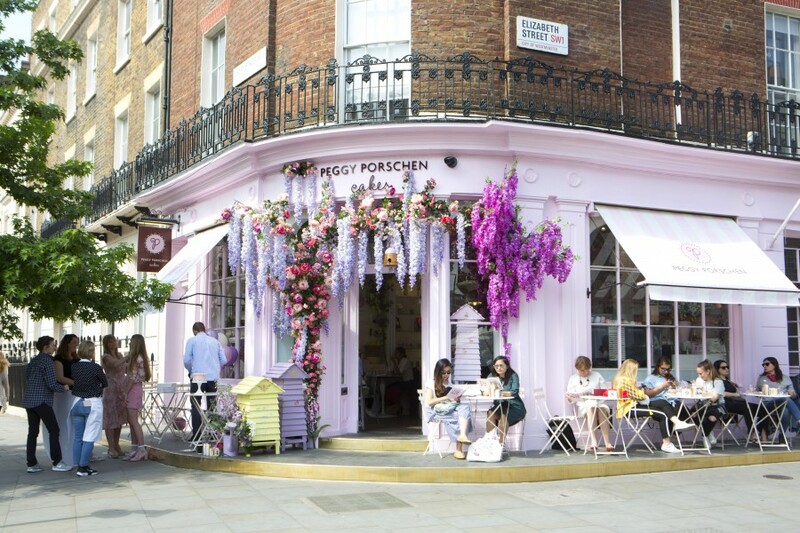 Prettily pink Polly Porschen Parlour, purveyor of probably the best cupcakes in the world, is another visual feast. Retailers’ corporate spiels prattle on about passion. Belgravia’s artisan shops raise enthusiasm, knowledge and zeal to another level. 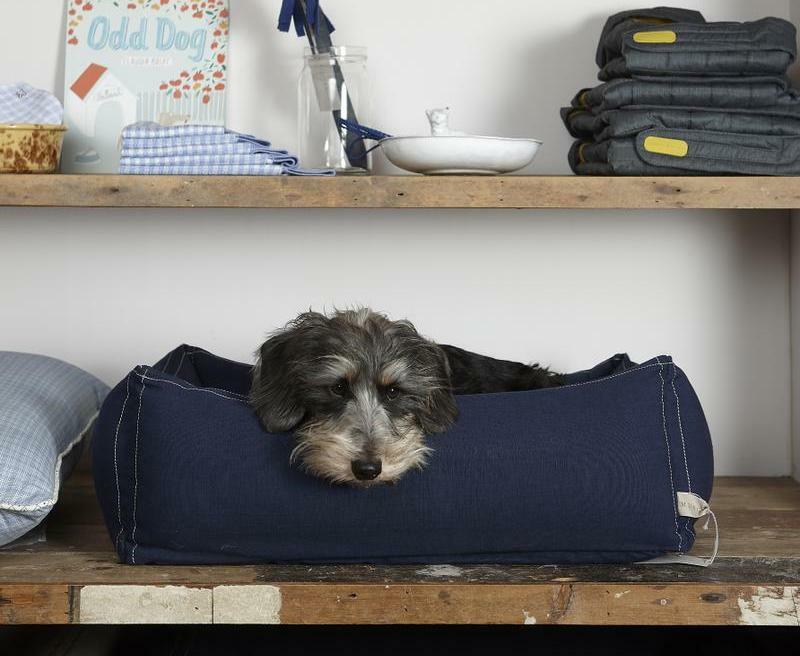 At Mungo and Maud, Dog and Cat outfitters, the care for pets is astounding, “Often in summer pavements are too hot for pets paws between 10 and 4,” says the assistant offering a Shea butter based balm that nourishes and soothes tired paws after an active day. Although Belgravia is quintessentially English with nannies walking little boys in their blazer-and-shorts to rugger-playing prep schools, there’s a cosmopolitan vision too. Keeping an eye on exhibitions at the nearby V & A, the Jumeirah Lowndes has produced a Mexican section and Mexican Cocktails, on its summer terrace. Cocooned by raised screens of olive trees, strawberry plants, thyme and sage it is yet another green oasis in the heart of Belgravia. 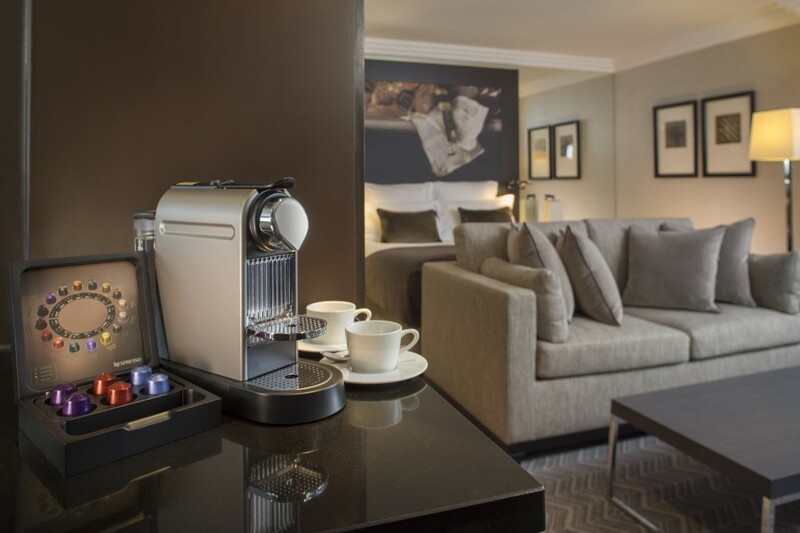 The Jumeirah Lowndes Hotel is just five-minutes walk from Knightsbridge Tube station on the Piccadilly Lane. Double rooms at the Jumeirah Lowndes, including breakfast begin from around £300 per night. 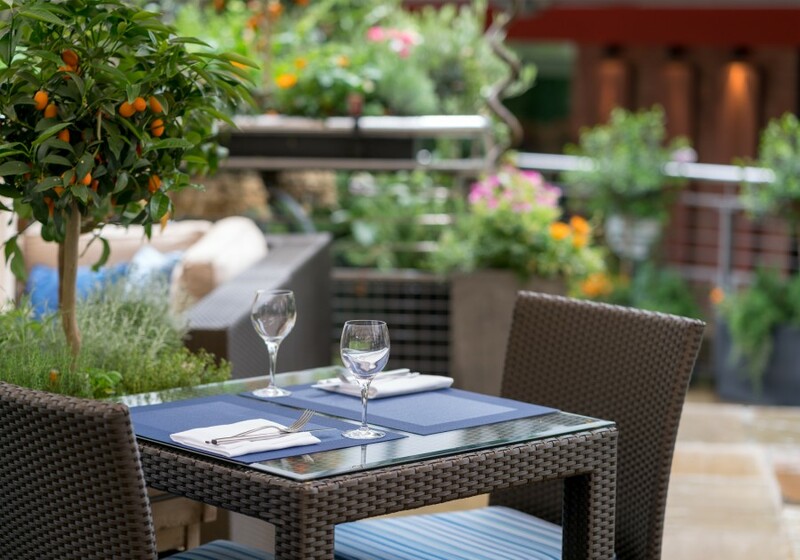 The Terrace is open for drinks, lunch and dinner during summer. 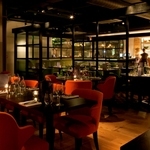 The Lowndes Bar and Kitchen is open throughout the year.